The most prominent feature of the 43 Sport Bridge is her spaciousness, both above- and belowdeck. 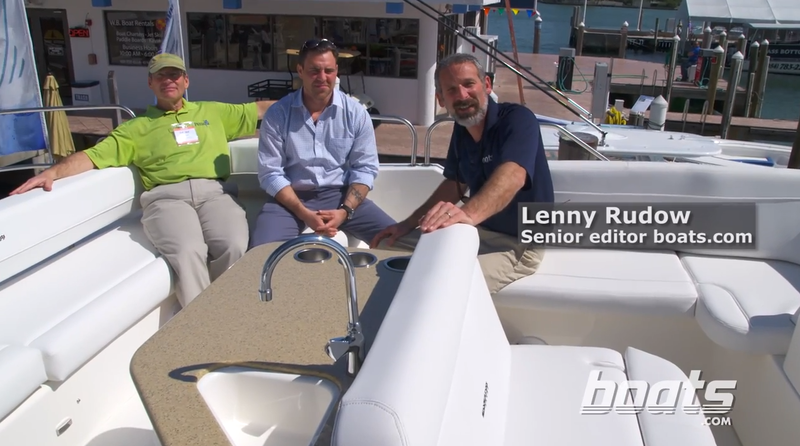 Every time the company introduces a new model, the boat comes with more than just cosmetic changes or marketing gimmicks. 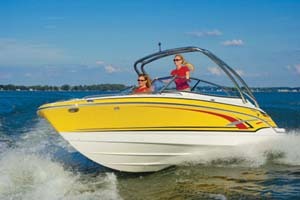 Therefore, the 43 isn't just a makeover of the 410 Sport Bridge, the boat she replaces in the company's line. She's a well-conceived series of improvements that make the whole greater than the sum of its parts. Silverton has long relied on focus groups to gather intelligence and direction for its new models. Listening to customers does make a good thing better. The most prominent feature of the 43 Sport Bridge is her spaciousness, both above- and belowdeck. 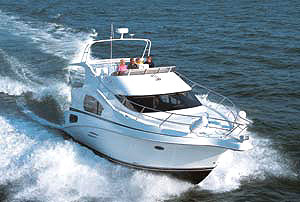 Take the flybridge, for example. It covers nearly half of the boat's overall length. 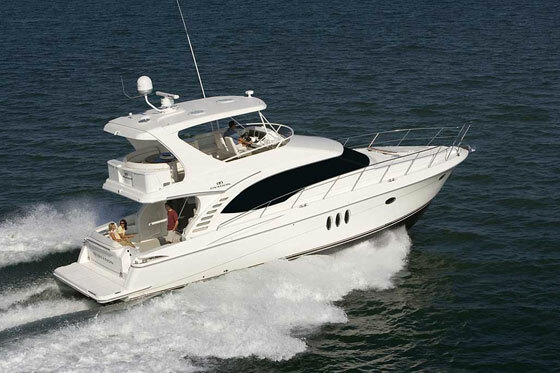 On it, there's bench seating for eight adults, plus two more at the helm in bucket seats. In addition, a sunpad is located aft, behind the seating area. There's another on the foredeck that's easily reached via Silverton's trademark SideWalk(r) on either side. Central to all the seating is a wet bar that can be fitted with an optional ice-maker or a refrigerator. The extended length of the flybridge provides complete cover to the cockpit, making it a shaded respite on a hot, sunny day or a shelter from the rain. 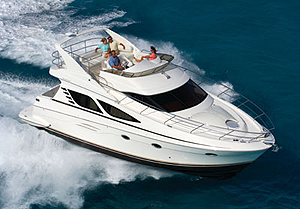 An extended swim platform is integral to the hull and has ample room for stowing a tender. The 43 Sport Bridge's lengthy exterior certainly reflects her interior; you'll be very impressed by the volume when you enter the salon. The full-beam width and the cathedral ceiling effect in the forward portion are striking. The space has the look and feel of a mega-yacht, complete with three levels, each separated by a step. The dinette is up and to the starboard front corner, while the galley is down and opposite to port. A generous use of glass, including the large expanse of the windshield, fills the space with natural light. Four opening windows, two on each side, provide cross ventilation. The 43 Sport Bridge has a refined and elegant decorating scheme. Cherry woodwork is used throughout; doors and drawer fronts are solid, not laminated. Silverton offers a choice of several custom fabrics that accent the space as well. 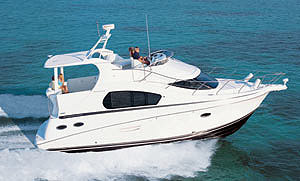 As with the flybridge, the salon has seating accommodations for a large group. A settee runs along each side, with the one to port converting to a double berth as a standard feature. Optionally, you can order it with two recliners instead. The semicircular dinette has a solid cherry table at its center, and two doors in the base open to reveal a storage compartment with cutouts for holding glassware and bottles. Another mega-yacht-style touch on the 43 Sport Bridge is not readily apparent. There's a low wood cabinet to the side of the cockpit doorway. At the touch of a button, a flat-screen TV rises from it for viewing. The screen has good sight lines from every seat in the house, yet it won't block the view through the doorway when not in use. The standard screen is a 20-inch diagonal, but you can upgrade it to 27 inches. 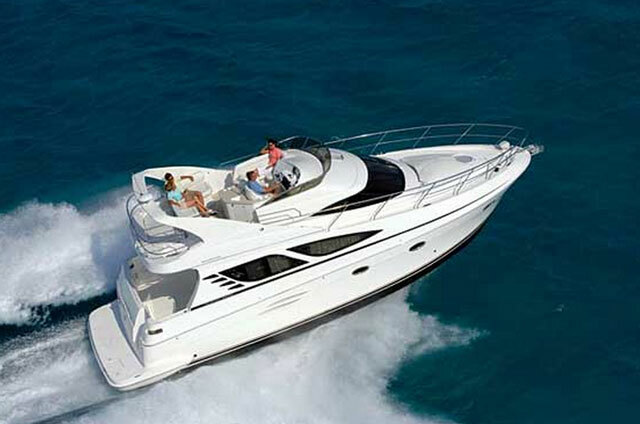 A Bose home theater audio system is part of the boat's stock entertainment package. In keeping with the mega-yacht theme, even the boat's main electrical breaker board, hidden behind a cherry wood door, is a work of art. The switches are mounted on a simulated burlwood panel topped by an embossed Silverton logo. One step down from the main salon deck takes you into the galley. A U-shaped Corian countertop spans the space, holding a stainless steel sink at one end and a two-burner flush-mounted cooktop at the other. Underneath, there's a side-by-side refrigerator and freezer, and a microwave convection oven resides in the cabinetry above. In addition to storage in the cabinets, a section of the galley floor opens to reveal a large storage bin. While some boat builders consider three staterooms a key selling point on a boat this size, Silverton opted for just two on the 43 Sport Bridge. By doing this, each one has more room and a private head. There's a queen-size pedestal berth in the master. It's accessible from three sides and doesn't have a pointed end in the bow. The mattress is square, save for slightly rounded corners. Most Silvertons have a split-head arrangement, and the 43 Sport Bridge is no exception. The shower stall is in the aft port corner; the toilet and the vanity are on the opposite side. Next to each of them is a hanging locker, equally sized, running from floor-to-overhead. The berths in the second stateroom are tucked away under the salon, but the forward portion has well above 6 feet of headroom. The separate berths along each side can be made into one with a filler cushion. There's another floor-to-overhead hanging locker here, as well as some cleverly concealed drawers in the entryway steps. The second head is on the opposite side of the lower deck companionway. Silverton didn't change the hull design on the 43 Sport Bridge. She handled as well as a 410 I sea trialed a few years ago. Conditions were less than favorable the day we took out the 43; wind and rain whipped the waters into a sloppy state, but the boat didn't seem to care. We enjoyed a smooth ride with a solid feel regardless of the damp conditions. Steering response was good and re-entry from chop was soft. The twin Volvo Penta TAMD-75 diesels aren't the most powerful engine package you can put into the 43 Sport Bridge, but they took our test boat up to a top speed of 27.5 knots. It was a very quiet ride too: The sound level at cruise was only 75 dB. Overall, the 43 Sport Bridge brings a lot to the table for a boater in the midsize market looking for some high-end extras.